Today I have just started learning the Kyma. At first, I want to say special thanks to Symbolic Sound Co. and Ms. Carla Scaletti for their friendly and quickly services (^_^). Yesteray all equipments were ready, and I set up them. 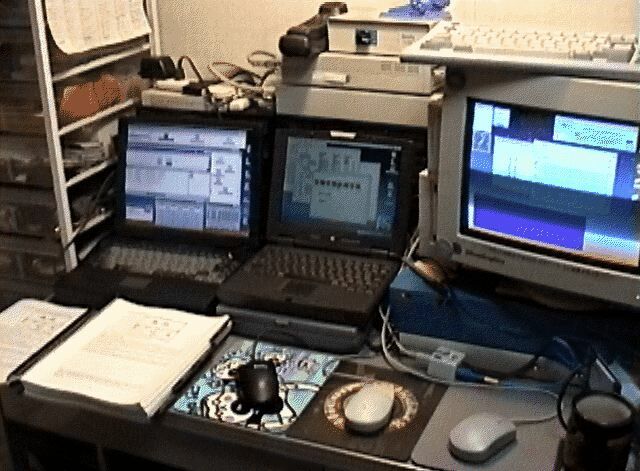 Today I set up the software environments : Ethernet connection of Kyma-control PC to Indy, PowerBook MAX MIDI connection to Capybara. I have just heard the first sound from Kyma! This is my desk in my room in my house now. This is only for Kyma learning setting during my winter holidays. When I do daily work as email/BBS/Web/FTP access, I replace the PowerBook to other place, and I use another Windows NoteBook under this PowerBook (^_^;). This is Windows NoteBook (EPSON) only for Kyma control. This display has 1024*768 resolution, so it is very easy to layout many windows. At this time, I do not understand these windows' meaning. I will try this Kyma software! 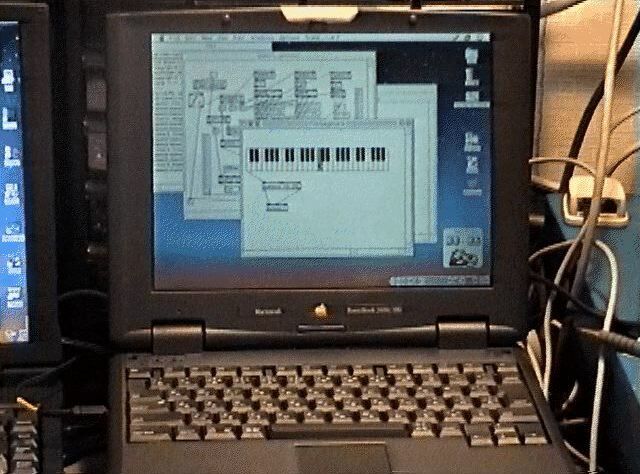 This is PowerBook2400c for running MAX. This is main system for my composition. 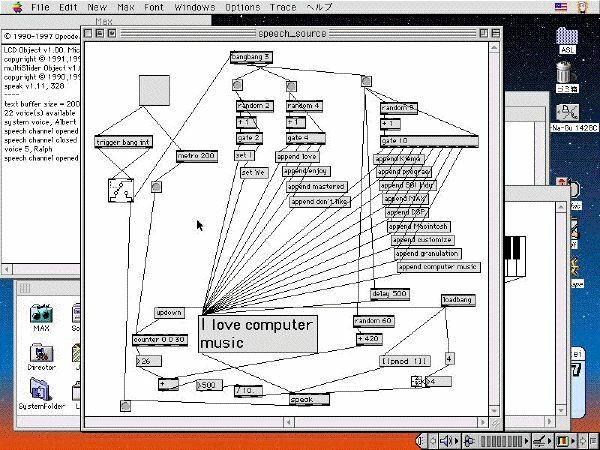 At this time, one patch is running as MIDI keyboard, and the other is running speech pharase generator for Kyma sudio inputs with "speech" object by Mr.ichi. 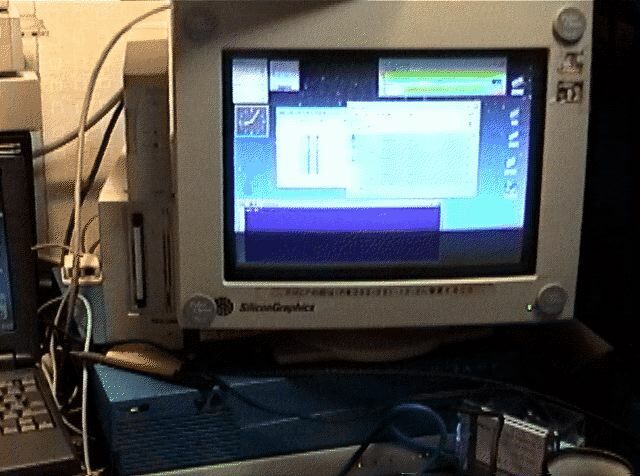 This is SGI Indy (256MBRAM,4.5GBHD,DAT,CDROM). This is also main system for my composition. Indy is the server for LAN in my room (not connected to Internet. Indy's IP address is 100.1.1.1 !). 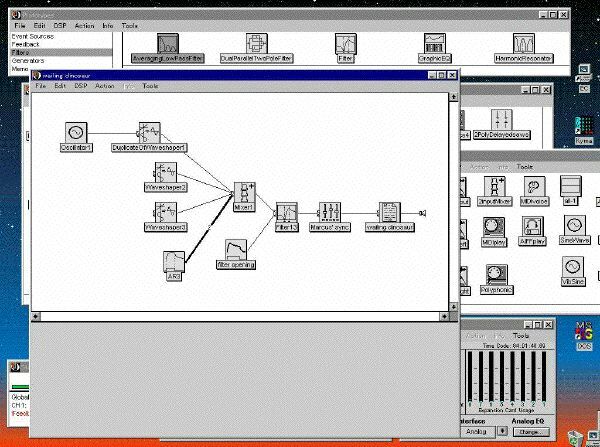 I use SGI "soundeditor" for my digital recording, editing. 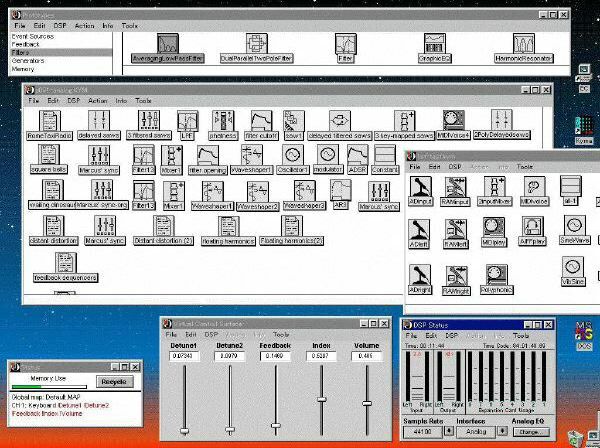 I produced many original signal processing softwares on Indy, and I use both. This is "Capybara", the main hardware of Kyma. This has full spec DSP(8 boards with 12MBRAM). I think this box is not so heavy, so I can take this to somewhere. This is Kyma manual. This manual has 560 pages, but I am not good at English (^_^;), so it is so heavy duty for me to understand Kyma. But, I will try this, and I will enjoy to try! Now I have started the "Introduction"(pp.1-87) of manual. I want to reach the next "Tutorial" tomorrow. I do my best. This is the screen of my finishing "introduction" section. Because I am s user of MAX, so I produced some basic "Sound" modules to concrete future Sounds. "ADinput" is only stereo live input module. "MIDIplay" is a simple template to generate sounds with MIDI. Yesterday I started "tutorials" with the "analog" subsection. There are 29 Kyma Files, and for example "analog" file contains about 50 Sounds! It's heavy work to check all Sounds, but it's so exciting and happy time. This is one sample Sound called "wailing dinosaur". I click both sub-Sound "Marcus'sync" and the same name, some messages appear below the screen. But I cannot click more deeper information for example "Filter13" of "Marcus's sync". I must open "Filter13" Sound for detail, but this time I cannot watch the global system of the main "wailing dinosaur". I am MAX programmer, so I want Kyma to display ALL basic Sound elements and their connections in the screen, but now I cannot do this. I have much frustration now. I might reached the "second step".... OK, I will try to understand. Yesterday I understood and solved how to see whole diagram. The way to see it was written few page later. And I understood little and little with "tutorial", I finished pp.89-pp.116. I cannot finish total 24 hours, but I am checking ALL Sound algorithms. This is my 1st favorite Sound of yesterday. The real-time input signal is frequency tracked, and 4 types of effectors are controlled by the output of tracking. I do not know how to construct this algorithm by commercial effectors. This is the other favorite Sound of yesterday. This is "granular reverb", i enjoyed very much. It was hard for me to program granular sampling softwares on Indy with C language, but this is much easier to use granulation technique for any field of music. This is the other favorite Sound of yesterday. 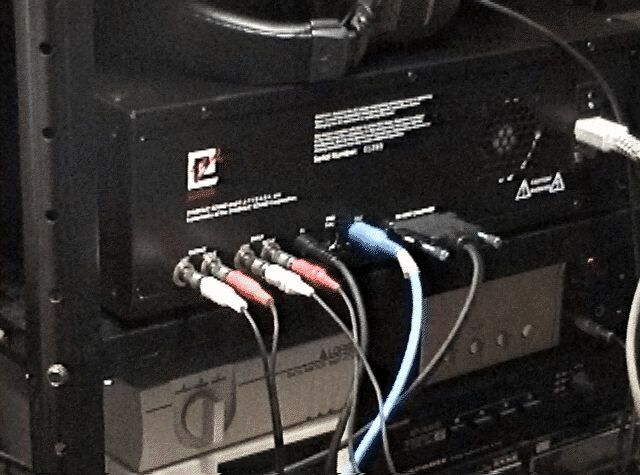 Live input signal is real-time sampled, and used for interesting playback effect. I heard many sound like this in the ICMC concerts, and I understand that they composed with this algorithm. Now I can produce this type of sound easily in my composition. I feel relax to study with the "tutorial", because I have understood the environmental concept of Kyma. Of course I cannot understand perfectly, but I can study the core points of the discussion without wondering about the usages and interfaces. OK, I will continue. Yesterday I studied pp.117-pp.148 of "tutorial" with checking and testing ALL example Sounds. Little by little, but I feel myself being understanding Kyma. I experienced many many fantastic Sounds, so I cannot introduce "my favorite Sounds" today. I was impressed by the potential of Kyma for analysis-resynthesis. Many ideas of my composition were inspired. I was requested for my next composition. I will have a workshop/concert at Souai University in March, and I will compose 3 works with Kyma. Current idea is : (1) voice, live processed by Kyma, (2) computer music with SHO (Japanese traditional instrument), (3) live computer music with my original "Harp-sensor". In this yearend, I spend time without TV watching, almost without drinking, without doing lazy something. I have healthy and exciting time every day, with sleeping 21:00 and getting up 03:00 or 04:00. All day I will spend my time studying Kyma. Yes, I will continue. Yesterday I finished the "tutorial". It took over 24 hours totally, but I deeply understood Kyma. 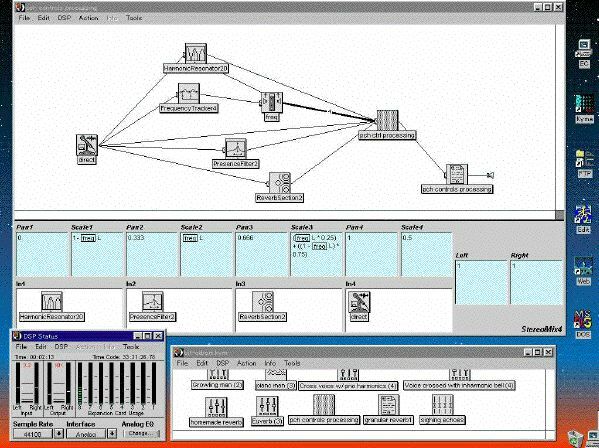 I thought that Kyma is a kind of DSP system for Computer Music in the past, but now I think that Kyma is the "environment". I enjoyed the "Class Editor" of Sounds, and I will produce many original Sounds with this. I had sent many emails of simple questions to Carla, and she kindly replied to me quickly. I am sorry to send questions that I myself understood in the next day, because I reached the page that commented. But now, this question is big. I cannot find the answer good for me. I will send another mail to her today. My question is how about treating(transmit/receive) the MIDI polyphonic pressure messages with Kyma. This is a block diagram of my work "Asian Edge" performed last year. 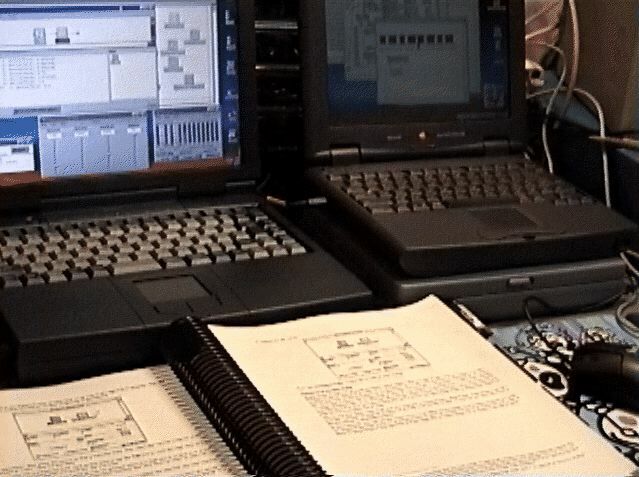 The full work of "Asian Edge" is performed with these equipments : SGI Indy<1>(for computer sound with MIDI) running original software produced by myself to generate many sounds in Unix environment, SGI Indy<2>(for computer graphics with MIDI) running original software to generate read-time 3D graphics controlled by sensors, Macintosh<1> running MAX patch to menage sensor fusion information, Macintosh<2> running MAX patchto control synthesizers, Samplier S2800i, Synthesizer K4r<1> and K4r<2>, Effector SE50, Microphone for Performer, Special Lute (original sensor) produced by myself, MIBURI and SNAKEMAN (original special sensor), Original MIDI Merger, Original MIDI Filter, Original MIDI Video SW, three Video Deck for BGV controlled via MIDI, four Video Camera controlled via MIDI, three Video Projector to display graphics, and PA.
All meterials of computer sound part are arranged from recorded Asian instruments, and signal processed with original softwares written by C in SGI IRIX(Unix), and multiple player software is also produced. Each sound file is not played by fixed sequence, but triggered by MIDI real-time control by sensors. 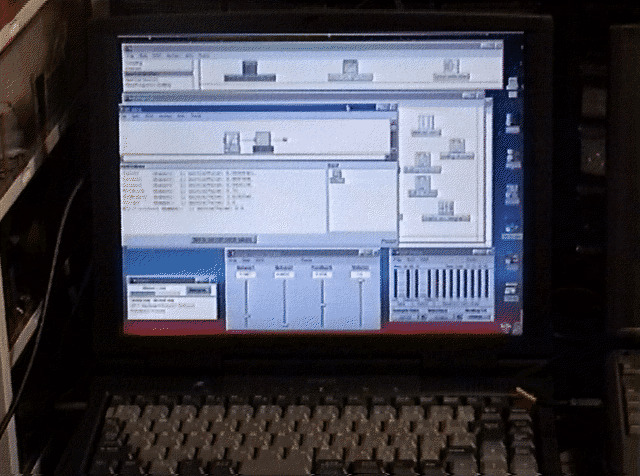 Indy workstation for sound part and graphics part are controlled with MIDI. In addition, back ground videos and live videos of performance with four video cameras are real-time switched by MIDI-Video switcher and three video projectors with the performance. Performer also speak and sing some phrases, this live voice and pre-sampled and processed sounds are modified by effector or generated by sampler. MIBURI sensor detects the motion and the body-language of performer, SNAKEMAN sensor generates trigger actions, and Special Lute is performed as traditional musical instrument. In this work, the real-time control is assigned to the MIDI polyphonic pressure messages, and in the future I want to use these messages with Kyma. So, It is not good for me that Kyma only treats NoteMessages, PitchBend, ContinuousController, ProgramChange, and ChannelPressure. The polyphonic pressure messages are almost free(not used) with commercial MIDI equipments, so I use original protocols. Of course I can treat these messages conerting to acceptable messages of Kyma by MAX, but I want that SPEC with my environment. 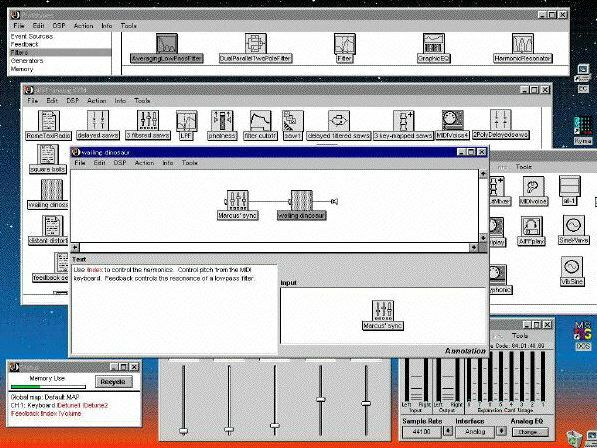 I want to make Kyma send status messages via MIDI to main MAX patch of my composition in real-time performance. 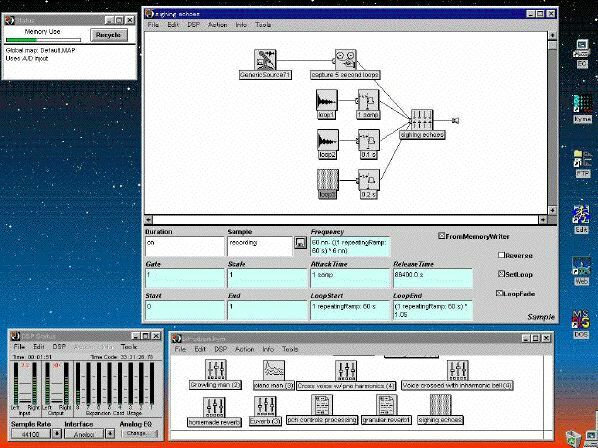 I will not use algorithmic composition SPEC of Kyma with smalltalk-80, because it is easier to compose algorithms in real-time performence of Computer Music by MAX. OK, I will continue. Happy new year! Yesterday I finished reading roughly the "reference manual" part. I produced some original Sounds with original Icons. Today I will check EVERY Sounds and arrage for my original with "Prototypes" section of the manual. This year is my first year with Kyma. Let's master the Kyma! Today I also get up at 3:00 am as usual these Kyma days. Yesterday I tested and arranged some sample Prototypes Sounds. I have produced about 30-40 original Sounds with the ClassEditor. 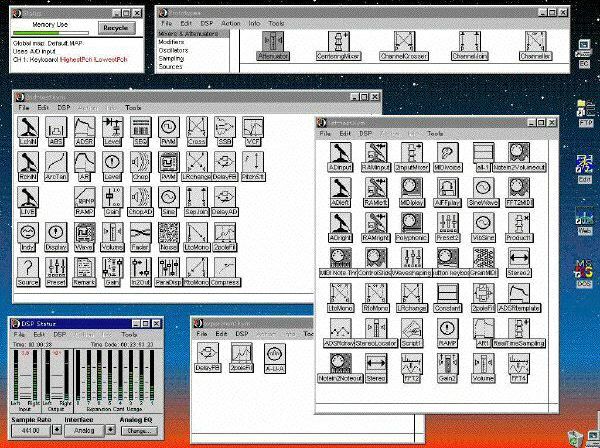 These are icons of the original Sounds. There are so many pages remaining of the manual, but I have less time to spend like this "whole day long only with Kyma". But I will do my best to finish checking ALL prototypes. Yesteray I have not so much time for Kyma, because I had to prepare camera-ready papers for my presentations of the conference of IPSJ (Information Processing Society of Japan) in March. I will have 3 presentations there. And, I will go 2days trip tomorrow, the lectures of myself at Kyoto and Kobe will start in a few days, and so on... So I decided that I finish this diary today. Because I have not been a "beginner of Kyma" already, and I must start to be the "guru of Kyma"! I am now writing the textbook "Music and Computer II", and this book will be the standard textbook for Computer Music people in Japan for few or more years. I just start writing of "Sound Generation / Signal Procesing Algorythm" section, and I use Kyma for the demonstrations! I also start preparing for the Workshop/Lecture/Concert of Souai Univ. 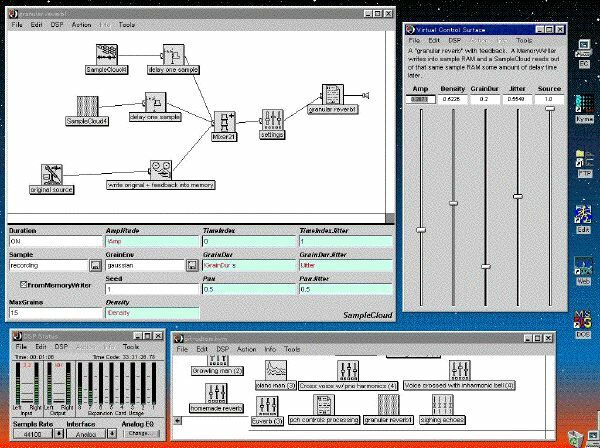 in March, and I will have a tutorial of "Real-time signal processing" with Kyma, and will have performances of my new works of Computer Music composed with Kyma!!! So, I cannot say myself as a beginner of Kyma now. I do my best being the poweruser of Kyma, and hope to be the "guru of Kyma" in the future. I again want to say special thanks to Kyma and Ms. Carla Scaletti. She kindly replies to my question e-mails everyday! ...Thank you.